Published: Oct. 16, 2012 at 01:47 p.m. Updated: Oct. 16, 2012 at 04:57 p.m.
SAN DIEGO -- The state of the Denver Broncos' locker room at halftime Monday night might have illustrated perfectly how Peyton Manning's presence has been felt in the organization, six games in. 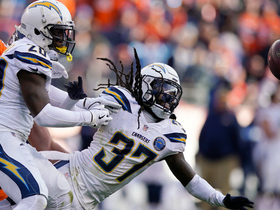 At the time, the score was 24-0, in the San Diego Chargers' favor. 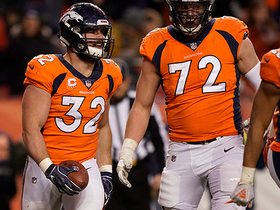 The Broncos had coughed up the ball twice on special teams. Manning had thrown a pick-six. Any offensive progress had been stymied by penalties. The defense had just yielded a 10-play, 66-yard scoring drive. "It was calm, man," veteran cornerback Champ Bailey said. "Just looking forward to what we had to do next." What happened next goes in the books, alongside so many other moments in the career of an all-time great. A succinct text came from a Broncos coach as the busses were pulling away from Qualcomm Stadium following Denver's scintillating 35-24 win: "He is special." "He," of course, is Manning. And by the time this one was over, he'd completed 24 of his 30 throws for 309 yards and three touchdowns against the one aforementioned pick. In the immediate aftermath, Manning's performance recalled his Monday night comeback with the Indianapolis Colts against the Tampa Bay Buccaneers in 2003, as well as battles back from the dead against the rival New England Patriots in 2006 and 2009. But more than that, it seems as if Manning has instilled a belief in the Broncos that even the craziness of you-know-who's run last fall couldn't come close to inspiring. Yes, Denver had fourth-quarter comeback bids fall short against the Atlanta Falcons, Houston Texans and New England Patriots in the weeks leading up to Monday's game. No, those failed attempts hadn't changed what everyone in Denver seems to know -- the game's never over, not until there are three zeroes on the scoreboard clock. "A lot of guys throw that pick-six, that we had in the first half, and who knows what you're gonna get out of them the rest of the game. But not Peyton," said tight end Jacob Tamme, who came to the Broncos from the Colts with Manning. "I think everybody came in here at halftime and knew we had a chance to do some stuff. Peyton just did what he always does. I can't think of any one thing. But once we got that first drive of the second half going, we knew." The Chargers defense came in knowing that Manning was struggling with the deep ball, and played him accordingly. It worked for a half. But it didn't take long for that to change. 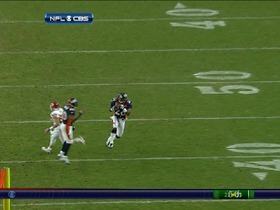 Manning's first touchdown throw of the day fit into a small window on a post to Demaryius Thomas 29 yards downfield. At the start of the fourth quarter, he shoehorned another ball to Tamme on third-and-16 for 25 yards. And three plays after that, he hurdled a pass rusher and drilled Eric Decker between the numbers for 7 yards. Decker matched the effort on the subsequent play, taking a short pass and bulldozing in for a 7-yard touchdown. "When he's playing like freakin' (Ben) Roethlisberger back (there), and he can't be sacked... I'm running my route, I turn around and he's slipping tackles," Tamme said. "He started laughing at one point, when he rolled out, and I don't know how many people he got around or through, but he's been tough to sack lately, too. That's a new thing for him. Been in the weight room, I guess." And Manning hadn't even made his best throw yet. That one, a 21-yard touchdown pass to his old buddy Brandon Stokley, which was delivered in a spot you'd have trouble sliding a credit card into, put the go-ahead points on the board for Denver. "Awesome. Man, it's... Only he can do that," Broncos linebacker Joe Mays said, as he waited with his family by the team bus. "I mean, there are couple guys that might be right there. But he's the best. I think he's the best quarterback to ever do it." 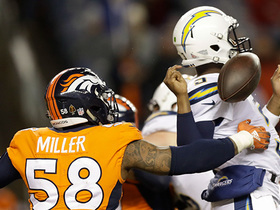 will re-air the Denver Broncos' historic 35-24 comeback over the San Diego Chargers in Week 6 on Wednesday, Oct. 17 at 9 p.m. ET. For the Broncos, the best part of this might be that it wasn't all Manning on Monday night, validating John Elway's efforts to give the quarterback something Elway himself had late in his career: a team that can win in a bunch of different ways. Defensive end Elvis Dumervil's strip-sack in the third quarter -- cornerback Tony Carter collected the ball and rumbled 65 yards for a touchdown -- was as big as any play Manning made. So was the pick by Carter that set up the Stokley score. A pick-six by Chris Harris and another strip-sack from Dumervil in the final minute showed that the defense can close an opponent out. Funny thing is, the players found a way to correlate that to Manning, too. "Same old Peyton," Bailey said. "One thing about it, (in the) second half of every game we've played this year, he's played great. Just knowing that you're gonna have that greatness, it does give you that little extra bounce; you know you're gonna have a chance to win. It expands your possibilities. When you know you have a chance to do something special, it makes you work a little harder." The Broncos have worked plenty hard to get this particular team -- which is massively different from the 2011 squad in several ways -- where it is now. As Decker said on the field afterward on Monday, "Our communication is better, because it's growing. Our relationship is growing as a unit. Fact is, (Manning) doesn't have to say a lot when we get to the line anymore; we're running the play a lot faster, because we all are on the same page. ... We can just go out and play." The bottom line is, Denver heads into its bye week at 3-3 having survived a brutal early slate. The Broncos' schedule is going to soften some, possibly setting Manning up for a season that is reminiscent of his 2008 campaign. That year, Manning struggled with a knee injury and the Colts started 3-4 before he led Indianapolis to a 9-0 finish, netting himself the NFL MVP award. The Broncos have work to do to get there, but they also figure to keep improving. That has to do with the teachable stuff. The other part of this equation was on display for all to see in San Diego. "You can't really practice resilience," Tamme said. "Hopefully, we won't have to be resilient every game. But that's something you can't practice. You can't teach it. That's a good thing, that we got it." The Broncos had it last year too, of course. But it was pretty clear that what we saw Monday night was something else entirely. Which is why you sign Peyton Manning in the first place.